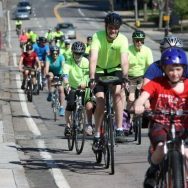 Join us to kick off Bay State Bike Week with our annual ride along Hancock and Washington Streets — the Spine of Quincy’s Bike Network Plan. We will be escorted by Quincy’s finest Community Police officers and celebrate the end of the ride with refreshments and a free raffle of items donated by local bike shops Anderson Bicycle and Landry’s Bicycles. Come show Quincy that you ride here and want safer streets. Please register here with Bay State Bike Week. How many miles does this ride consist of? Can I assume since this is not a race, that the speed is more casual? The ride is just under 10 miles. Yes, this is a casual pace ride. We are a social riding group, not a fast-paced group. I hope you can join us!